If you’ve opened up the Gallery in The Sims 4, you’ve likely seen some amazing creations, from absurd mansions to mind-bending homes. And we often see the same question: how do they do that?! That’s what inspired us to invite members of the community to teach you how they build the amazing things you can find on the Gallery. 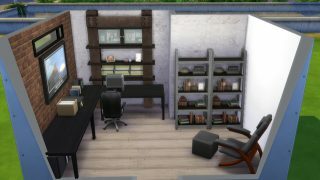 Today, we wanted to show off ways to upgrade and improve your Sim’s office! 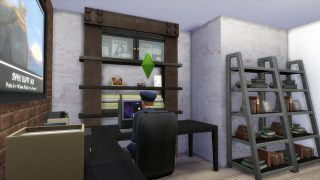 We invited popular builder James Turner (also known as The Sim Supply) to write up some tips on creating an amazing office in The Sims 4. Below is his guide*. 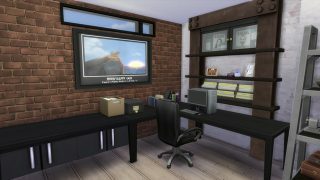 One of the rooms that can often be overlooked in your Sims’ homes is their office. I often like to design rooms that I would love to have, and that suit my needs. I find this allows for me to get a lot more experimental with the room. Here is how I like to put together the rooms that I create and share. Step One: Choose an interesting shape. While working with a regular rectangle or square is not a problem, I tend to prefer creating odd shaped rooms, as this can often challenge how you’re going to end up furnishing it and possibly edge you out of your comfort zone. While we’re at it, let’s get some temporary lighting in there so we can see what we’re working with! Step Two: Choose a color scheme for the space. This will often direct the entire style of the room, don’t be afraid to use more than one wallpaper either. 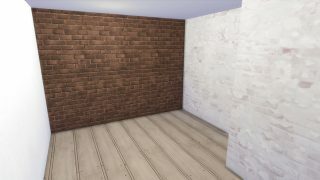 In this case, I’ve used three; the exposed brick wall, painted brick wall, and a flat white painted wall. This simple choice of using multiple patterns can break up the otherwise bland walls. Step Three: Decide on the basic object placement. Before we start detailing any of the room, let’s decide where all the key items will be placed. For an office, this includes the desk, bookcases and possibly a reading chair. Take this time to also figure out where you want windows and prominent wall decorations. 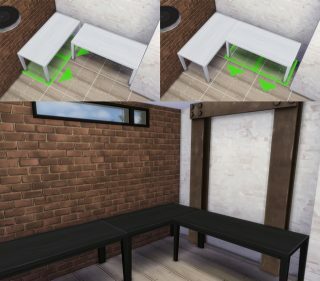 In the example above, I’ve combined three desks to create one large corner piece. To do this, enter the move objects cheat, bb.moveobjects, and then while placing the desks, hold the ALT key on your keyboard to move the desks as close together as you can. Step Four: Detail the space. I’ve used a few interesting techniques here to create a space that is clean, yet looks like it has been used at the same time. With the move objects cheat still enabled from step three, I’ve placed some items in interesting places. For example, the shelves intersecting the steel beams and the small kitchen cabinets under the desk that appear as storage. 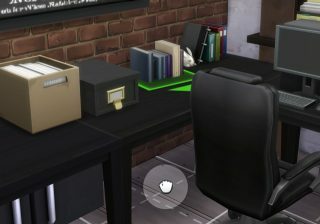 One fun technique I’ve discovered is the ability to place items completely freely on top of desks. It’s fairly simple once you know how to do it. Place an item on the desk, make sure you still have move objects enabled. Pick it back up, this time holding ALT to allow free movement, place the item as if you are trying to put it on the floor, this will allow you to get it in any position on top of the desk, or any surface for that matter! Step Five: Make sure it all works! We’ve done some pretty unconventional things with the items we’ve placed, so it’s always best before sharing your creation that you make sure it actually functions as the room it’s designed to be! Go forth and create some awesome spaces! Hopefully you’ve learned a little furnishing trick or two. You can find some of the creations I’ve shared on the Gallery under the ID: TheSimSupply. You can also find me on Twitter @JamesTurnerYT if you’ve got some burning questions! Want to learn more about The Sims 4? Check out tips on building a great kitchen, and learn how to make an amazing bathroom in The Sims 4.